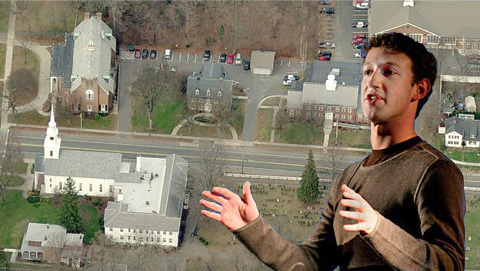 Facebook has been around since 2004 starting out as a social network at Harvard University. 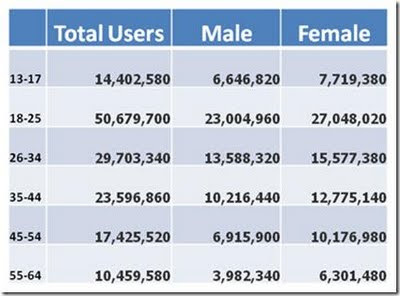 Now there are approximately 630 million Facebook users in the world; 95 million users in the United States and an estimated 3500 users in the town of Longmeadow, MA. Average user has 130 friends. Average user spends 15½ hours/ month on FB. Average user visits FB 40 times per month. Average user spends ~ 23 minutes during each visit. 200 million people globally access FB via a mobile device each day. More than 30 billion pieces of content are shared each day. FB generates a staggering 770 billion page views per month. See reference for above data. Facebook started with people sharing personal information on their personal profile pages….it now has moved to become a much broader communications tool with the introduction of business and organization fanpages. At last count Coca Cola had 32.5 million fans on their business fanpage and it was growing by 300,000 every week. 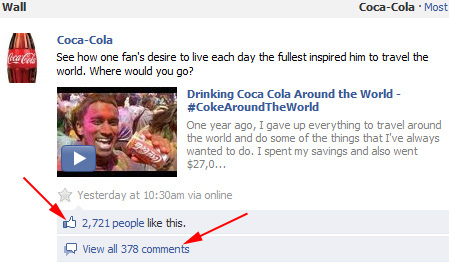 A fan is a Facebook user who has visited the Coca Cola fanpage and clicked the “LIKE” button at the top of the page. The FB user does not need to revisit the fanpage again since all of the Coca Cola fanpage content will automatically be delivered and posted on their FB profile page. If the information is interesting, the FB user can simply click the “LIKE” button or add a comment to the post and it is then shared with all of their FB friends. 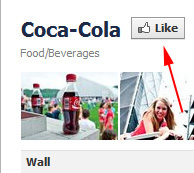 Consider this… if Coca Cola adds a new entry on their fanpage, immediately this information is displayed on the FB profile pages of their 32.5 million fans. If only 1% of the Coca Cola fans click the "like" button or add a comment (with the average FB user having 130 friends), this information is then sent to the FB profiles of at least another 40-45 million FB users assuming there are no friend-friend duplications. That is quite an extraordinary reach. Since FB relies upon friend-friend interactions, movement of information in this manner can occur with great speed and be of great influence. This is the power of Facebook- which the world has recently witnessed during the emergence of the freedom initiatives in Egypt and elsewhere. Facebook is no longer the place where college drinking photos are unintentionally (or intentionally) shared with family, friends and business colleagues. It has become a medium for social interaction of much greater importance. 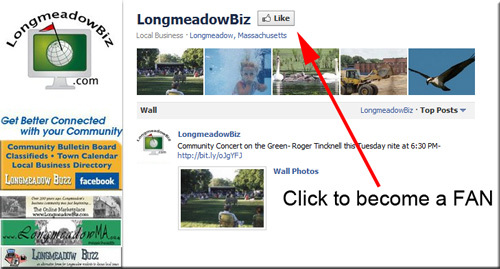 What can Facebook do for Longmeadow? From what I have found there are only 2 Facebook fanpages in Longmeadow that have more than 150 fans so at this point there is no effective central point for dissemination of local information. An effective fanpage for Longmeadow will likely require about 1000-2000 fans in order to have a potential reach for the entire town. Hopefully, as people become more comfortable with Facebook, the number of FB users in town will also grow which is likely given the remarkable growth and favorable publicity that Facebook has received over the past year. The LongmeadowBiz fanpage was created in November 2010 as an online communications network for Longmeadow residents and town businesses. If you visit the LongmeadowBiz fanpage you find that it is open for public participation by anyone who has a Facebook account. 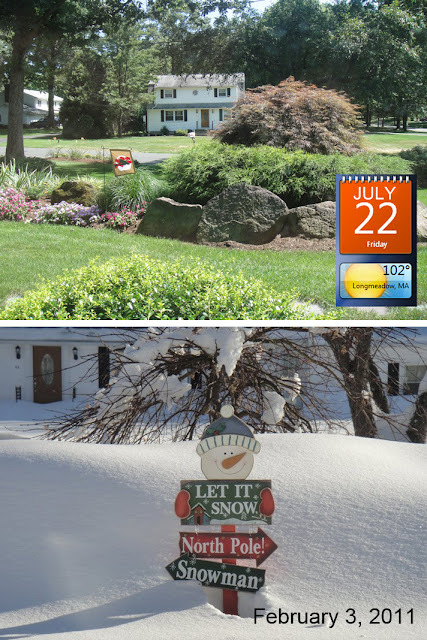 Posting of information of interest to Longmeadow town residents (events, town/ school / community items, etc.) is encouraged. Postings will be monitored and those who post objectionable content will be reported to Facebook and banned from posting in the future. I am hopeful that this open venue will not be sabotaged and forced to become a closed venue. For those who are new to Facebook, you can view the LongmeadowBiz fanpage (<-- simply click this link) without becoming a user. Your privileges will be limited until you create a Facebook account. I would encourage everyone to take a look at the LongmeadowBiz fanpage and if the content is of interest, please click the "LIKE" button at the top of the page and become a FAN. A view from our front window. It was not very long ago that we were complaining about the record amount of snowfall and trying to get the heavy snow removed from our rooftops. Now we are hoping that there are no power outages that would shut down our air conditioners. I hope that all of the people affected by the June 1 tornados are doing OK. Almost one year ago, the Longmeadow Select Board decided to take control of the town website and convert it to the "official town government website" rather than allowing it to continue as Longmeadow's community website. A new website with a similar masthead and Internet address but with significantly different overall appearance has now emerged to fill the gap that was created by the Select Board's actions last July. Longmeadow's Longmeadow.org website was created by a group of volunteers in 1997 as a community website not as the "official" town government website. As the website evolved the content of the website became broader than what could be considered for inclusion on an "official town government" website. Numerous newspaper articles were written about the Longmeadow.org website that reflected its community oriented content. Content included the Longmeadow HS Alumni Directory and Varsity Sports Archive as well as many webpages created and hosted for community organizations including the Longmeadow Historical Society/ Long Meddowe Days, Newcomers Club and the Longmeadow Gardeners on the Green. Community events such as Long Meddowe Days were frequently spotlighted on the homepage. As highlighted in my last Buzz post the Select Board and the Town Manager are now finding it difficult to create policy to navigate the content and link related issues. Since the creation of the Longmeadow.org website almost 14 years ago, there was only one other incident in 1999 about links/content that created an issue. Interestingly enough, it was also about a school building project. For those who are interested, here is a link to a Springfield Republican newspaper article about this situation which almost caused a major change with the Longmeadow.org website. The new Longmeadow Community website at LongmeadowMA.org restores many of the legacy sections that the Select Board deemed unnecessary as well as some new additions. However, the LHS Alumni Directory and LHS Sports Archive are two sections that will likely disappear forever.... both of which were viewed by many website visitors. One new section is the Longmeadow Virtual Library which provides easy access to the many web based library resources (both through Storrs Library and the Longmeadow School Department) available for Longmeadow town residents. In addition the Longmeadow Virtual Library provides a list of quick links to other town resources that have virtually disappeared. I recommend that the Select Board and Town Manager stay focused upon providing a better "town government" website than what currently exists today and stop trying to also become a "community" website that has led to the current situation. It may be a long time before LongmeadowMA.org, LongmeadowBiz.com, the LongmeadowBuzz blog and the LongmeadowBiz Facebook Fanpage have visible links on the Longmeadow.org website. However, I believe that Longmeadow residents are savvy enough to find websites/ blogs that provide them with important information about their town.